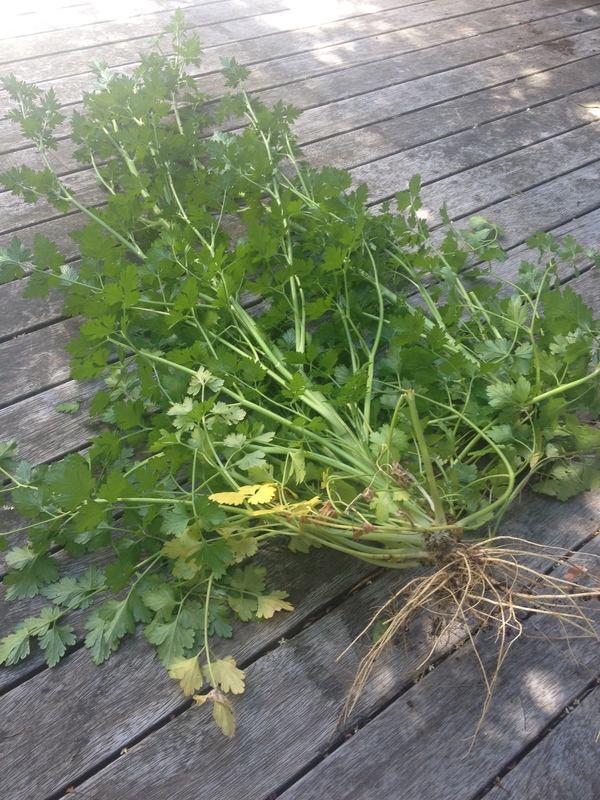 It was time to slay the mighty parsley-beasts. I felt a little regretful about this, as they had done me proud by growing all green and bountiful, despite my doing very little to help them. But, many leaves had been picked for many dishes, and now the beasts had gone to seed. Apparently the Ancient Romans themselves ate a paste called ‘moretum,’ consisting of herbs, cheese and oil. This was of particular interest to me, as my only memories of food and the Ancient Romans, scraped from the dim, dusty part of my brain labelled Third Form Latin Class, were that stuffed field mice were typically on the menu. How unfair of me. 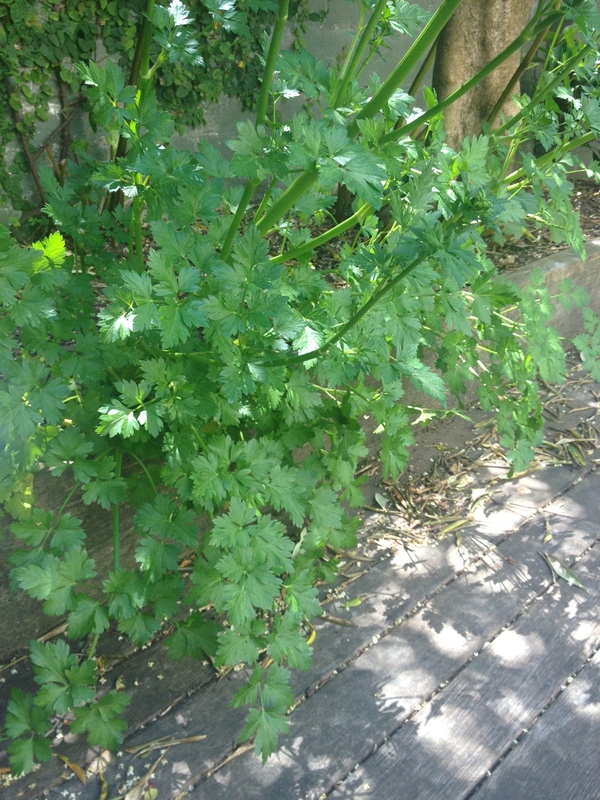 I shall be contacting the editors of Ecce Romani forthwith to suggest a showcasing of moretum and pesto. It seems to me that these days, we are increasingly embracing any number of nut, cheese and herb combinations for our pesto. 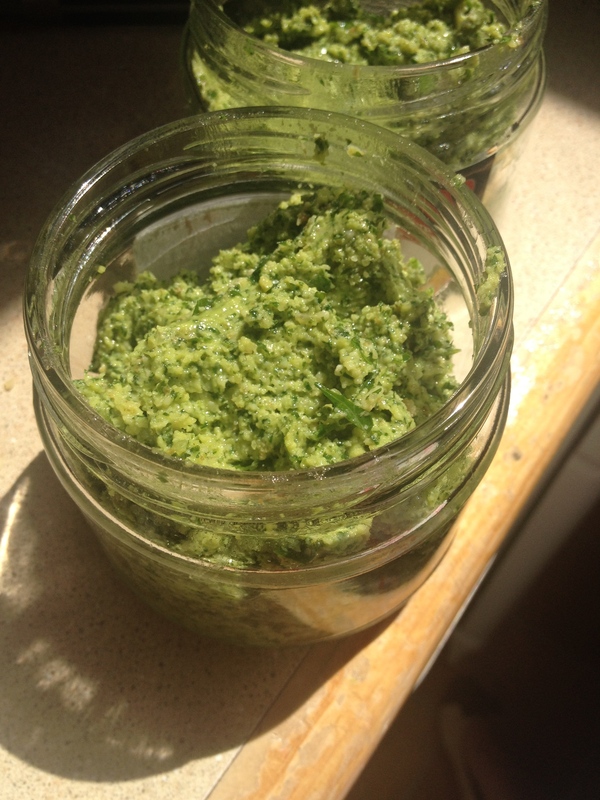 The parsley pesto I have made here, based on this parsley pesto recipe, contains walnuts, almonds, parmesan and olive oil. I made it like so.. 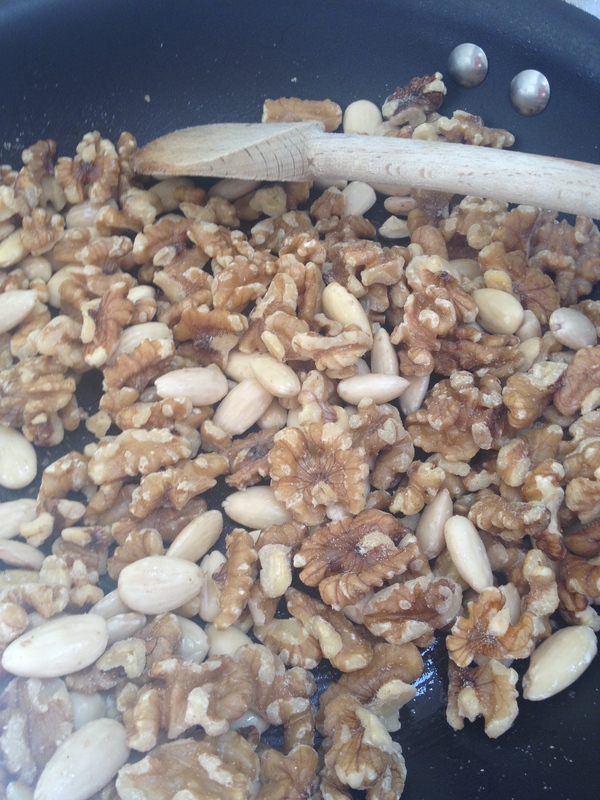 I toasted the almonds and walnuts of the stove-top in a non-stick frying pan until they were all golden and smelling tasty. 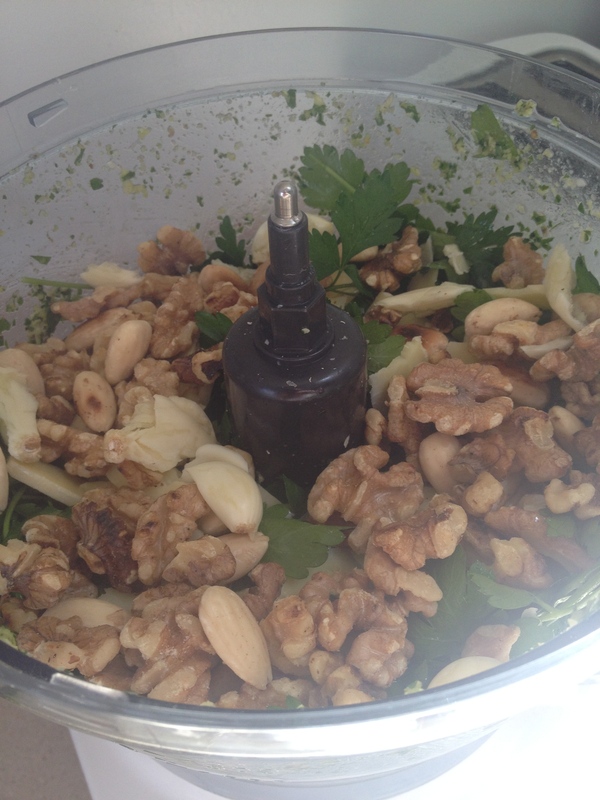 I ripped the parsley into smaller bits with my hands, and added it to the bowl of my food processor, along with the toasted nuts, parmesan, olive oil and plenty of ground black pepper. I processed it until it made a smooth paste, adding a little salt and squeezing in some lemon to taste along the way. I wound up with 6 jars of roughly 250mls capacity, meaning that a few friends and family members had pesto thrust upon them. Our first meal with the bounty was a salad with roasted potato, shredded poached chicken and plenty of pesto. This pesto is rather tasty slathered on freshly toasted bread, and I am reliably informed it tops pasta quite nicely too. Ecce Romani!!!!! oh man, the memories. I know! I hadn’t thought about those books for years, and suddenly triggered by pesto, there they were!